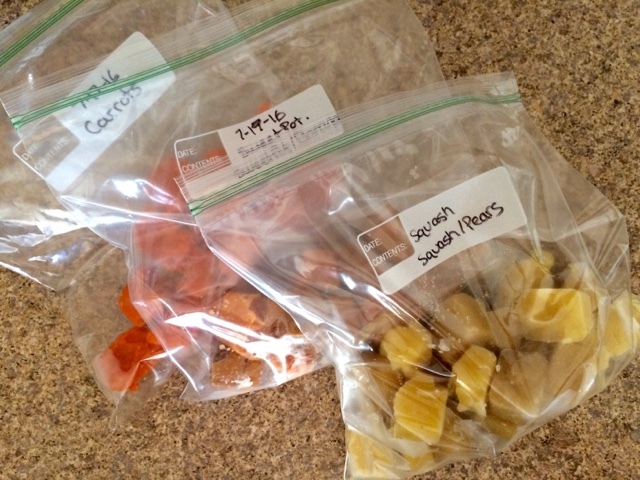 When it comes to baby food, I always knew that I wanted to make my own when I had a baby of my own. For one, I feel like it's healthier for the baby to have fresh food. Another reason is that it is so much cheaper! I've browsed the baby food aisle and what I've found is that it would get pretty expensive to feed my baby store bought food everyday, especially if I wanted to use the organic baby food. 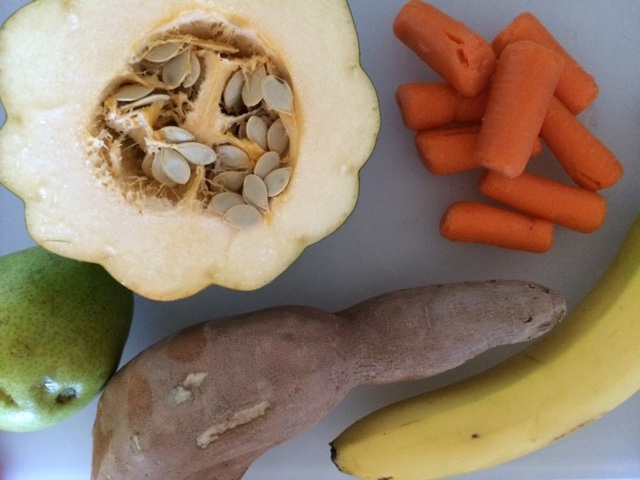 I feel like most working moms might feel that it's easier to just buy the store bought food, but honestly, I have found making my oun baby food to be super easy. 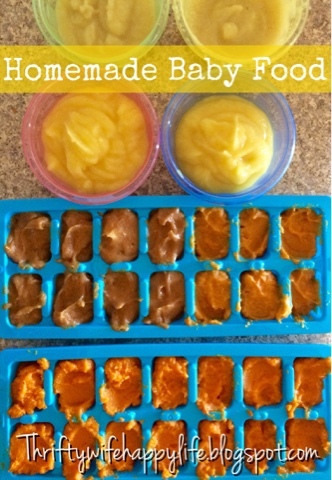 I'm the queen of short cuts, so I have found ways to make homemade baby food almost as easy as opening up a jar of food. 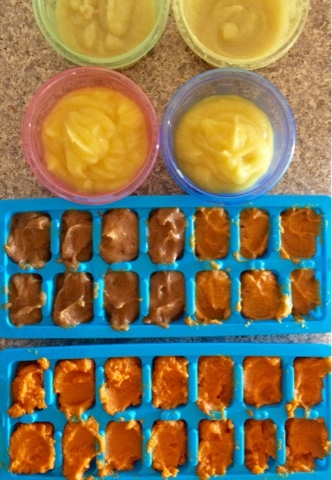 Here is how I make my homemade baby food. First, I buy my fruits and vegetables. For fruit I always buy fresh and I always look to see what's on sale. For Vegetables, I mostly buy fresh, but for veggies like spinach, peas and broccoli, I will usually just get a frozen bag for a dollar. Once I pick out my fruits and vegetables, I have to cook them down. Vegetables like squash, sweet potatoes and carrots can be a little more time consuming, because I either have to bake it in the oven or boil it in a pot. That's why I normally set aside a Sunday and make those foods. When it comes to making fruit or using the frozen vegetables, that doesn't take more than 5 minutes. For fruit, I peal it and put it in a bowl with a couple tablespoons of water and I just microwave it for about a minute, just to soften it up. I do the same thing with the frozen vegetables. Instead of using a food processor or my big blender, I use my Cuisinart hand blender to puree everything. It makes the clean up process so much easier. After I puree all the food, it's time to store it. If I'm just making a small batch of fruit, I usually just pack it up and store it in the refrigerator in some Tupperware. If I'm planning on making a large batch of food to last a while, then I use the ice try trick. I proportion the food into the ice try, freeze it and once it's frozen I put it into freezer storage bags and put it back in the freezer. I love the ice try trick, because I always have food on hand and ready to go. I pop it into the microwave for 30 seconds and my little guy has dinner all ready. Food is all portioned out and ready to be warmed up. So far my little guy has no complaints on the food. We've tried carrots, acorn squash, sweet potato, spinach, peas, cauliflower, pears, apples, peaches plums and bananas. He loves them all. I'm loving that my baby is eating healthy and I'm also saving money.